Experience the brilliance of Waikiki's weekly fireworks show from the most unique vantage point on the island - a helicopter high above the sand! This Novictor exclusive tour includes the lights of the Honolulu skyline, an unclose, aerial view of the Friday night fireworks at the Hilton Hawaiian Village hotel, and a night-time pass over the USS Arizona Memorial. Thundering fireworks, the lights of Honolulu, and the stunning moonlight on the Pacific are all available on this one of a kind helicopter tour. As the sun wanes and night falls on Waikiki, you’ll fly over Oahu’s South Shore as its lights reflect off the gentle waters beneath you. Honolulu's famed port shines breath you and the Aloha Tower sparkles as it rises to meet the stars above. 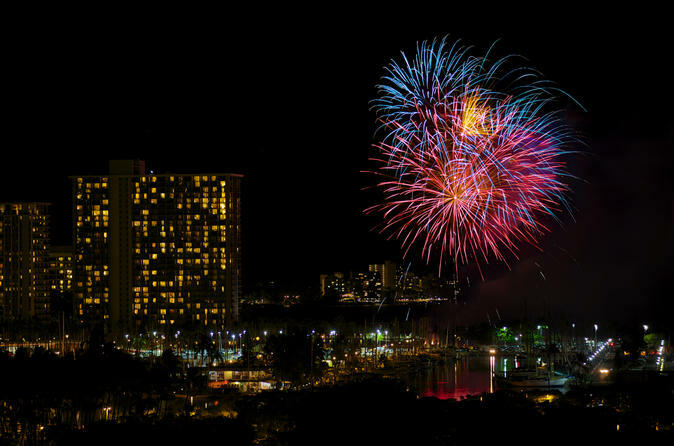 Honolulu's skyline leads you to Waikiki in time for an up-close view of the weekly fireworks show at the Hilton Hawaiian Village. There you will witness fireworks as you’ve never seen them before – from above – as they explode into the evening sky and illuminate the sand and surf below. After the final sparks disappear into the deep blue, your helicopter rounds Diamond Head and flies through the beautiful night sky to Pearl Harbor. There the USS Arizona, softly and reverently lit, awaits, the brilliant final act of this uniquely Oahu production.